For quality auto repair and car care from a mechanic you can trust, bring your vehicle to Specialist Auto Tech. From oil changes to engine overhauls, our shop is equipped to repair and resolve any issue you have with your vehicle. Best of all, most repairs come with a 12 month / 12,000 warranty on parts, so you can be confident that your repair has been done right. 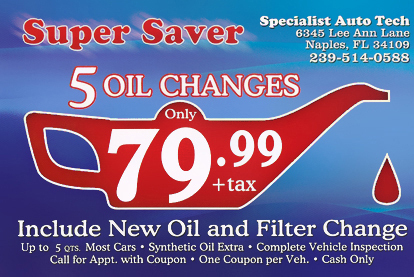 Coupons – Save money on your next auto service! Trust our ASE-Certified mechanics to treat your car right. 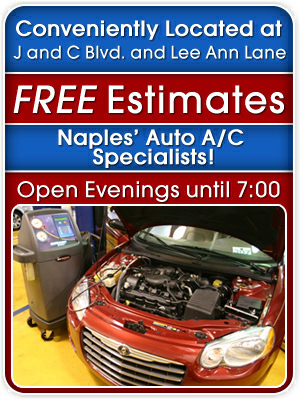 Call Specialist Auto Tech today at 239-514-0588 to schedule service, or come to our shop at 6345 Lee Ann Lane in Naples,Florida.